The Quebec immigration selection system for Quebec Skilled Workers is designed to discern immigration candidates who are most seemingly to become economically established in the province. Skilled Worker applicants who decide to reside in Montreal or in another city or region within the province of Quebec are evaluated under a different system than applicants who wish to settle elsewhere in Canada. Skilled Workers or international graduates in Quebec may apply to immigrate to Quebec under what the Government of Quebec calls its ‘Regular Skilled Worker Program’, also known as the Quebec Skilled Worker Program (QSWP), or the Quebec Experience Program — PEQ. Applicants who are successful under the Quebec Skilled Worker Program are issued a Quebec Selection Certificate (CSQ) and can then apply to the Government of Canada for permanent residence. A medical and criminal background check is conducted as part of its approval process by the Immigration, Refugees and Citizenships Canada(IRCC).In order to qualify for a CSQ, candidate must score enough points under the Quebec Immigration selection factors. A single (unmarried) applicant must score at least 50 points based on this system, while an applicant with a spouse or common-law partner must score at least 59 points. Education: To be eligible for selection, Quebec Skilled Worker Program candidates must, at a minimum, hold a diploma corresponding to a general or vocational high school diploma in the province. Area of training: Applicants to the Quebec Skilled Worker Program are awarded points for their individual area of training, or field of study, based on the latest list of Areas of Training published by the Government of Quebec. Generally, the points value assigned to a particular field of study is decided by the labour market needs in the province of Quebec. Validated Employment Offer: Based on location of the job, upto 14 points are awarded under the Validated Employment Offer selection factor of the Quebec Skilled Worker Program. Work Experience: Under the work experience factor of the Quebec Skilled Worker Program upto eight points are awarded. Age: Up to 16 points are awarded for the applicant’s age under the Quebec Skilled Worker Program. Language Proficiency: Up to 22 points are awarded under the Language Proficiency factor of the Quebec Skilled Worker Program. Stay and Family In Quebec: Up to eight points are awarded under the Stay and Family in Quebec factor of the Quebec Skilled Worker Program. Spouse/Common-law partner Characteristics: Up to 17 points are awarded under the Spouse or Common-law Partner’s Characteristics factor of the Quebec Skilled Worker Program. 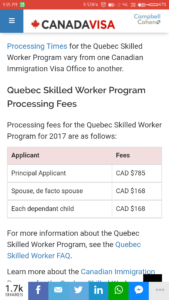 Presence Of Accompanying Children: Up to eight points are awarded under the Presence of Accompanying Children factor of the Quebec Skilled Worker Program. 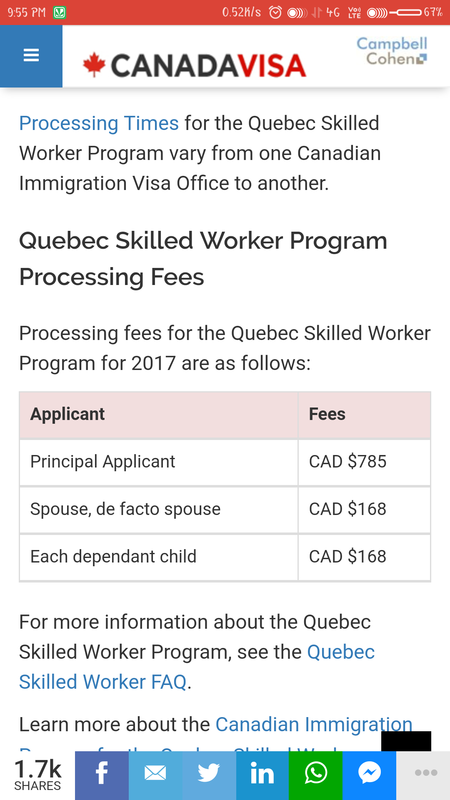 Financial Self-sufficiency: One point is awarded under the Financial self-sufficiency factor of the Quebec Skilled Worker Program (QSWP).To be considered for selection under the QSWP, applicants must submit a complete Financial Self-sufficiency contract, to the Quebec Ministry of Immigration.